A TRADITIONAL STRATEGY to address contracting equity has come through the establishment of mandated sub-contracting goals, beginning with the federal government in the early 1970s. In 1989, the Supreme Court ruled in the Croson case that the City of Richmond, Virginia, could continue its MWBE sub-contracting program if it was more narrowly tailored – based on availability rather than population – and based on a disparity study. 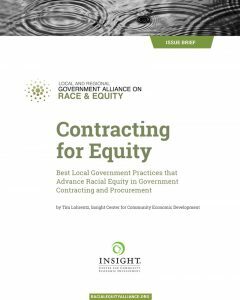 The ruling resulted in the use of disparity studies as a staple of local government race-conscious programs, which usually have mandatory sub-contracting goals. Disparity studies compare the availability of MWBEs for specific types of work to the utilization of MWBEs for that type of work. When disparities exist, a race-conscious approach is appropriate and allowable. Voters or legislators in six states have made it (almost) impossible for states or local jurisdictions to operate race- and gender-conscious programs, like mandatory sub-contracting goals: California, Washington, Michigan, Nebraska, Arizona, and Oklahoma. State governments and local jurisdictions in these six states are limited to race- and gender-neutral measures, meaning no overt preferences based on race or gender. The anti-affirmative action measures passed in these states also impact public employment and higher education.